A common theme revolves around wearing diapers, which in most cases will give rise toward a role-identification of an infantile personality. Over time the behavior in most all cases will expand to include other infantile objects such as pacifiers, baby blankets, baby bottles and soft stuffed figures. We dove pretty deep to get a better understanding of these statements and I told a couple stories which I think illustrate the points being made. Enjoy this excerpt by using the player below. After yesterday’s news of Rearz filing a petition to trademark the acronym “ABDL” (or will that be ABDL™️?) blew up the interwebs, I decided to share my thoughts with member’s of the treehouse. This is an excerpt from Toddy’s Treehouse – the mobile treehouse, actually. It was recorded in a moving vehicle. If you’d like to find out more about becoming a member of the club visit the treehouse at patreon.com/toddystreehouse. What do you think of this? Does it bother you at all, or meh, no biggie? I finally got to try the BetterDry diapers. They are the (nearly) all white version of Crinklz, and are now available from my favorite online retailer. I’ve heard so many good things about these diapers that I just had to try them. But can they possibly replace my current diaper? Well, here are 7 reasons why BetterDry diapers may be my new Pampers. This is an excerpt from a special episode of Toddy’s Treehouse which I recorded in the car. Which explains why it sounds like I’m recording an episode from inside my car. If you want to hear more visit Toddy’s Treehouse at patreon.com/toddystreehouse to learn more about our super-secret ABDL listeners club. This is an excerpt of the latest meeting at Toddy’s Treehouse where we continue to discuss the essay What Is True Infantilism? by Kathi Stringer. Just use the player below to listen to a bit of it. The entire episode can be found on our Patreon page. Follow me on Twitter to keep up on the latest from Toddy’s Treehouse. I’m super excited about releasing the very first Bedtime Stories with Toddy. We’re starting the series with one of my very favorite Fairy Tales: Jack and the Beanstalk from the Red Fairy Book. What ABDL doesn’t enjoy a bedtime story at night after getting washed-up, freshly diapered, put into some cozy jammies, and being tucked into bed with a favorite plushie and pacifier? I know I do! This series is available for some of our super-secret club members at Toddy’s Treehouse, but I wanted to share an excerpt of it with everyone. If you enjoy this, and want more, we’d love to have you join us on our Patreon page. Sweet dreams, and crinkle-crinkle little star. You’re about to listen to and excerpt of the very first episode of Toddy’s Treehouse where we discussed the essay, What Is True Infantilism? by Kathi Stringer. You can listen to the entire show by becoming a member at patreon.com/toddystreehouse. Remember: I will be deleting all episodes of ABDLcast at the end of October. Make sure to download any (or all) episodes by then. That way you can have them forever. Welcome to the very last public episode of ABDLcast. It’s been over one year since the previous episode was released, and it was a heavy topic: Mental Health and ABDL. We received many comments, tweets, and other interactions on that one. I want to thank each of you who have reached out to share your own experiences with mental illness, and to offer support, friendship, and general kindness. There are some really wonderful, caring people that listen to this show. Unfortunately there are also a lot of people that are the exact opposite of kind. And those people… well, I just do my best to avoid and ignore them. But, enough of that for now, I wanna talk about diapers and stuff! After all, that’s what this show has been all about. A New Diaper For Toddy? The biggest personal change since the last time I’ve talked with you is that I have been wearing diapers nearly 24/7 since right about that time. For about the last year I have been spending all but seven or eight hours per week wearing diapers. Of course, I don’t wear in the shower, or if I leave the house to go some place where it is not a good idea to wear a thick, crinkly diaper. Now that I think about it, 7-8 hours per week is probably being too generous! When I do get out of the house I’m almost always wearing a diaper. And I don’t wear thin, discreet diapers; I wear NorthShore Supremes. And they are thick, though not overly crinkly, because they don’t have a tape landing panel. Before that I was already wearing diapers to bed every single night for at least a year. You who have listened to past episodes will know that I rarely use my diaper. I wear for comfort, for emotional security, and for anxiety relief. It’s really a form of self-nurturing and self-medication. They always have been. But after all the hundreds and, probably more accurate, thousands of NorthShore Supremes that I’ve worn I may be ready to make a change. I’ve been experimenting with some samples and I think I’m getting ready to order a case of a another brand of diaper. 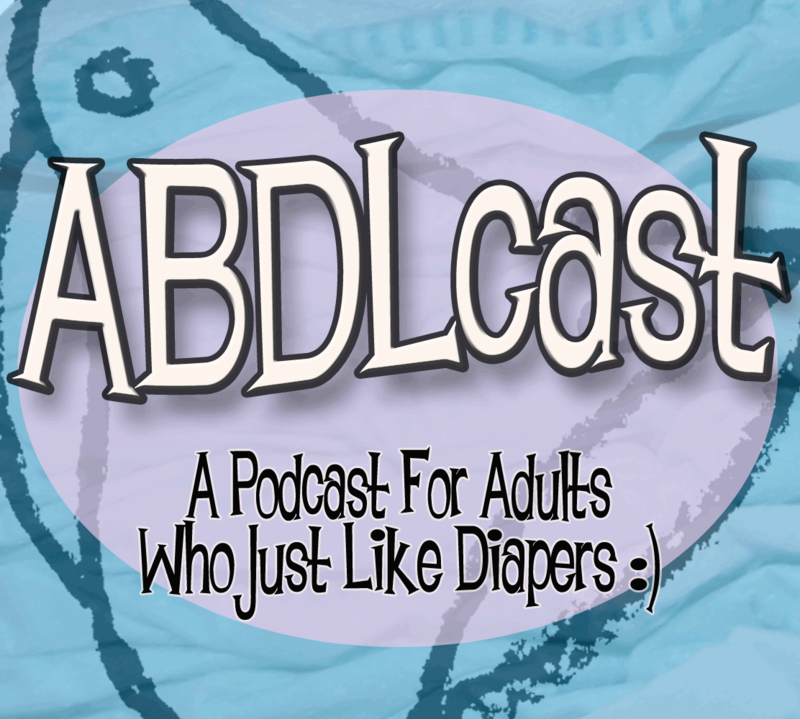 Since starting ABDLcast I have intentionally avoided the designer ABDL diapers. I did not want to show favoritism for a specific company. Don’t get me wrong, I know I’m not quiet about my love for NorthShore Supremes. But they are not a designer, niche ABDL diaper company. It’s a medical diaper through and through. And they are still my favorite diaper of all time. But can that change? Of course it can. I am getting ready to order a case from a well known ABDL diaper company. I have been trying various samples and I think I may have found a diaper that might work better for my needs. But in order to really find out I am going to have to wear a bunch of them. So, I will not mention the brand just yet. You’ll have to stay tuned for that. Another new thing in my life is my pacifier. A while ago I got an adult sized pacifier and I love it! I sleep with it every night. I couldn’t imagine not having it. In fact, I get quite anxious imagining not having it available when I need it. Keep in mind that I am not AB or DL. I’m that little slash between them (AB/DL). It’s not a sexual fetish for me, and I don’t regress to a baby. Wearing diapers and sucking on a pacifier is just my normal. I see myself as the perpetual kid that wears diapers. The same goes with using a pacifier. This is indeed the last episode of the ABDLcast. I will soon remove all past episodes from iTunes, Google Play Music, or wherever podcasts are found. I will remove them from our website and anywhere else I can. Until then you can download all the episodes for yourself. There will be no more ABDLcast. Instead, I’ve built a treehouse! A secret fort! A private club for a limited number of friends who want to be a member. It will be a safe place for us to gather for diapered fun! One of our tag lines has always been, “Audio entertainment for ABDL’s,” and that is what we will continue to be, and even more so. The treehouse is at patreon.com/toddystreehouse. If you don’t join, I’ll understand, and I’ll miss you. I just hope that you can understand why we’re putting this show behind a diaper wall. I wanted to create a private listener club and this is the best way I could find to do it. And it will make it possible for us to create a better show than ever! And that is worth a diaper per month right there. I don’t know how many episodes we’ll do on it. And i don’t know if you’ll feel as strongly as I do about this essay. But it should generate some good conversation between you and I. And that’s what makes doing this so fun! So, until next time, Rest In Peace, ABDLcast. Long live Toddy’s Treehouse! I’ll talk to you there.